As the nation continued to reel from President Donald Trump’s shock decision last month to remove all U.S. troops from Syria, news came Wednesday that an unknown number of U.S. soldiers were among at least 15 killed in a bombing in northern Syria. Amid such continued violence, one would think the president’s withdrawal would have ever more urgency. And yet, just about everyone in Washington has attacked his decision to pull out. The reflexive hatred for Trump that dominates the national conversation is bad for the U.S., especially when it comes to foreign policy. This is not to say that the president isn’t a flawed figure; after all, I’ve spent the better part of two years critiquing most of his policies. Still, when the man demonstrates prudent judgment—as in his recent calls to pull U.S. troops out of Syria and Afghanistan—he should be applauded. But that’s unlikely to happen in a divided America, as long as an interventionist, bipartisan consensus runs the show in Washington. That’ll be no easy task, of course, as the military-industrial-congressional complex has gathered ever more power in the generations since President Dwight D. Eisenhower—a Republican—coined the term. Still, there’s one way, in the near term, to expose Beltway bellicosity on foreign affairs: Force Congress to publicly debate and vote on each of America’s ongoing wars. Let’s start with Syria, since it’s there that President Trump has a rare opportunity to shift the onus of responsibility for the bloody conflagration onto U.S. representatives. And that’s the last thing cowardly congressional members want. Legislators in Washington—imitating the media pundits they increasingly resemble—prefer only to yell, scream and tweet about every foreign policy move this president makes. Some of Trump’s actions have undoubtedly been unacceptable, but whenever he goes with his “instincts” and recommends troop withdrawals and less war in the Middle East, he’s immediately castigated by politicians from both sides of the aisle. 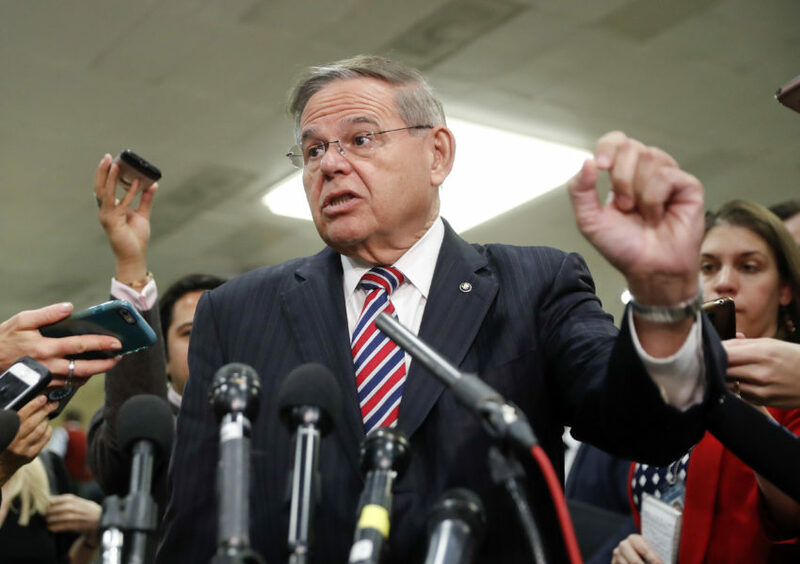 Ranging from New Jersey Democrats like Bob Menendez to stalwart Southern Republican hawks such as Lindsey Graham, they’re all essentially selling the same snake oil: perpetual war. Not that these members of Congress do anything about it—they’re all talk. In that sense, they’re no more useful than the mainstream media pundits peddling the same militarist agenda. The Senate traditionally has a powerful role in overseas policy, but these days, all the Foreign Relations Committee chairs and co-chairs do is give interviews in the Capitol Rotunda. “Conservative” constitutionalists must recall that it’s Congress that’s supposed to declare wars, whereas the president only executes the chosen policy. So instead of squawking about Trump’s “isolationism” and “irresponsibility” in Mideast affairs, these empty suits should head back into their deliberative chambers and craft some alternative policy for a change. None of this is new. The executive branch has increased its size, scope and power in foreign policy since at least World War II. Nevertheless, it’s not too late to rectify part of this unconstitutional state of affairs. After all, on Syria and Afghanistan, Trump has the strategic high ground, in that the wars are aimless failures, and the support of a majority of Americans who are sick of endless war and ready to bring the troops home. In a sense, that’s exactly what Trump ran on: ending “stupid” wars. But the militarist elites don’t care what the people—especially Trump’s supporters—want. As far as they’re concerned, they alone know what’s good for America. Or so they’d have us believe. In reality, whether they’re election-obsessed legislators or ratings-obsessed media moguls, these interventionists all serve the same corporate masters. They play politics even when lives—both of U.S. troops and countless civilians—are at stake. That goes for pugnacious Republicans of the Lindsey Graham mold, as well as hypocritical media celebrities like Rachel Maddow and her Democratic fan club. On the ostensible left, we’re even seeing an entire generation of born-again hawks rise in opposition to any and all de-escalation, even if those same liberal politicians and pundits would likely celebrate the same decision were it made by President Barack Obama. With this in mind, Trump should send future Syria and Afghanistan policy to Congress, forcing its members to debate and publicly vote for either more or less war. Congress, with the exception of the recent Yemen War resolution, hasn’t done so since October 2002. At the very least, constituents would finally know where their representatives stand on our many wars and could hold representatives accountable should they choose to follow strategic inertia and prolong these unpopular conflicts. The health of American democracy depends on adhering to the Constitution and its representative institutions. Legislators—not unelected presidential advisers, media pundits and retired generals—should decide on matters of war and peace. That’s why Americans shouldn’t canonize men like former Secretary of Defense Jim “Mad Dog” Mattis. This darling of the mainstream left and right was neither martyr nor missionary. At every turn, it appears, he and his allegedly self-described Committee to Save America, subverted Trump’s popular intention to end decades-long wars. That wasn’t his job—or John Kelly’s or H. R. McMaster’s—so in some ways, resigning was the most appropriate decision for Mattis. Note that the secretary of defense chose to finally fall on his sword not over U.S. support for starving 85,000 Yemeni children, but in response to a modest de-escalation from an aimless military intervention in Syria. A curious ethical decision to say the least. Mattis wasn’t the only one on the president’s team to disapprove of the withdrawal. Just take national security adviser John Bolton, who at every turn seems to backtrack or soften the blow of the president’s policies. Bolton works harder than anyone in Washington to continue—or even radically expand—U.S. military involvement in the Middle East. Though his actions would seem to run counter to Trump’s recent anti-interventionist announcements, Bolton remains a fixture in a very confusing White House. This is yet another reason the life-and-death decisions of war and peace must be decided in public—not in the West Wing or corporate boardrooms, but rather on the floors of the Senate and the House of Representatives. If the bipartisan crowd of congressional members who’ve been so critical of Trump’s proposed Mideast withdrawals sincerely believe that more war is the answer, let them cast their vote accordingly. Even if ultimately the citizenry proves apathetic and fails to hold its representatives accountable, a public war debate and vote would be refreshing. It’s the least that my fellow soldiers—and our many nameless victims–deserve.